I've written about Talks About Singing, or How to Practice by Annie M. R. Barnette at least four times now (just checked). And wouldn't you know it? The book is now available in the US, Italy and the UK. Fancy that. Of course I am left wondering if my posts have had something to do with it. I mean, wouldn't you wonder? Truth to tell: I have an original hard copy that I found after a long search at Abebooks. Crack it open and one can hear hundred year old dust talk. Thank you Daniel! 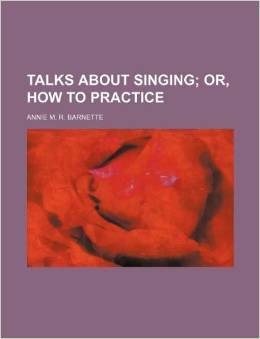 I AM really grateful for your contribution to singers and voice teachers. Keep up your great job! Thank you for your comment and good thoughts, Era uma fez.